The Control Center user interface can display the elements in the selected scene. If you select an element in the Elements list, it can also display the drawings in this element. 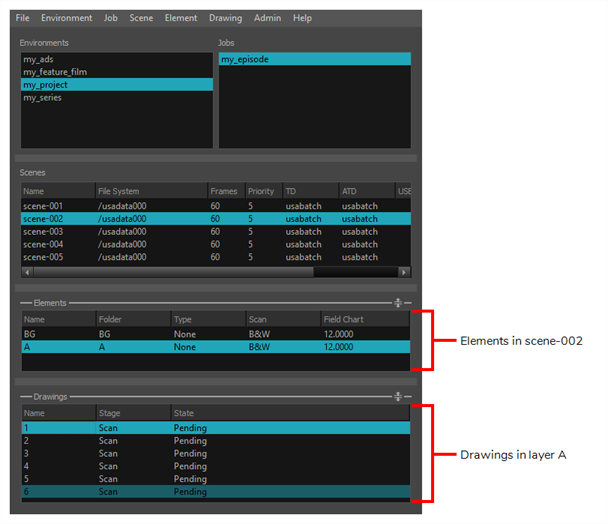 However, if you want to add, remove, rename or edit elements and drawings, you must open the scene in Harmony. To view the selected scene's elements, click on the Expand/Collapse button right of the Elements panel at the bottom of the Control Center user interface. To view the selected element's drawings, click on the Expand/Collapse button right of the Drawings panel at the bottom of the Control Center user interface.